Denny Hamlin led 89 laps Sunday at Martinsville (Va.) Speedway and was in contention to win his fourth-straight race at the track before a pit stop under green with 40 laps to go and untimely caution shortly thereafter trapped the #11 FedEx Ground Toyota a lap down and relegated the team to a 12th-place finish. Hamlin was forced to pit for fuel and tires from the fifth position on Lap 459. Just eight laps later, an accident in Turn 2 brought out the race’s final caution, and Hamlin — along with a handful of other cars that pitted — were down a lap to the leaders. The #11 took the wave around to get to the tail end of the lead lap, restarted 14th and made up two spots in the final run. Kevin Harvick passed Dale Earnhardt Jr. with three laps to go for his second win of the season. Hamlin started fifth and quickly moved to the lead on Lap 35 around the 0.526-mile ‘paper clip.’ A number of cautions in the first half of the race bunched the field for double-file restarts, and the preferred inside groove on restarts was vital. 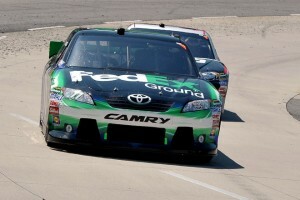 Crew chief Mike Ford instructed the FedEx crew to make a number of track bar adjustments throughout the race to help Hamlin battle a race car lacking grip off the corner, and a top-five finish was well within reach until the final caution. 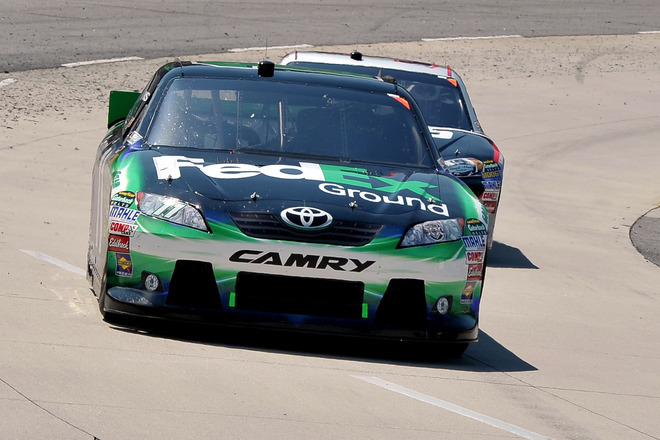 The 12th-place result snapped a nine-race top-10 streak for Hamlin at Martinsville. Hamlin climbed two spots in the unofficial NASCAR point standings with the finish, and is now 19th after six of 36 races, trailing leader — and Joe Gibbs Racing teammate — Kyle Busch by 74 points. The Sprint Cup Series heads to Texas Motor Speedway next weekend for a 500-mile event on April 9.